I’ve been off grid the past ten days as I had a weekend of very early photography workshops then rolled right onto an airplane to head south to Texas to enjoy the 17th Annual Galveston Featherfest. It was the first time that I have fully participated in a birding festival and the numerous outings that they offered was exciting with a wide variety of locations and bird species. There are many times that I recognize that some outings are great birding trips and others to be great bird photography trips. I knew this trip would be more about birding and my friend and I managed to see 124 species in four days which is pretty fantastic. From countless shorebirds to little songbirds and everything in between. Someone asked me which bird species I enjoyed the most, and to tell you the truth..I enjoyed them all! 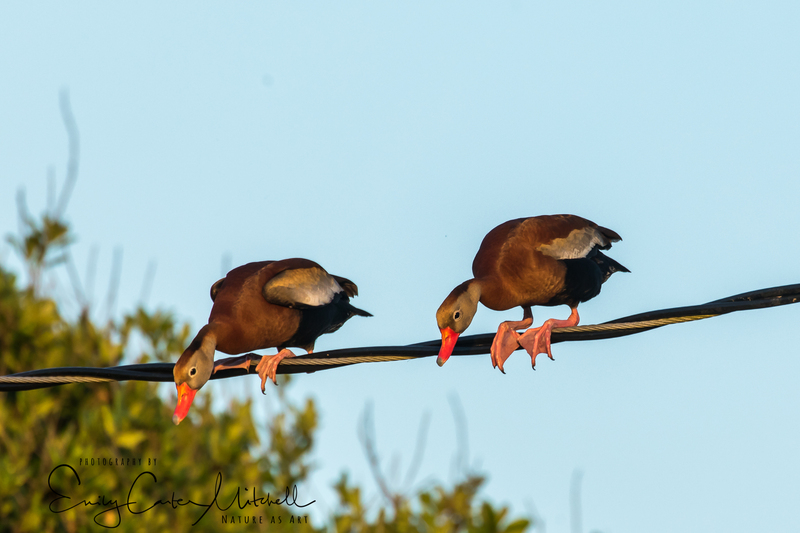 But the most comical one was the Black-bellied whistling ducks that at first were elusive and then were quite willing to show themselves. In particular this one pair of ducks that we watched landed on a power line. The first one arrived and then the interloper came in throwing the first one off balance. It looked like they were going to fall off, but somehow they managed to stay on the line squeaking at each other and wobbling about until things settled down. Then there were the rowdy Greater boat-tailed grackles that were all over the place. Sounding like a squeaky door or someone banging on a metal fence they made certain that everyone knew they were around. They were perhaps the mascot bird of the area as they would sometimes approach you, perhaps in hope of a handout. One even thought of a way to fight off boredom and decided to chase a White Ibis for no reason at all. He certainly gave the Ibis a run for his money. The weather through most of our stay was tough for photography. With cloudy, blustery and strangely ocean misty days the light was just awful all around. Even though several of our outings departed at sunrise by the time we arrived to where there were good birds it would be mid-morning with harsh light and the birds further than I would have liked. One particular place I was really interested in was the Smith Oaks Rookery at High Island Audubon bird sanctuary. I hadn’t visited before and from what I could gather it seemed to be a bit more challenging for photography than the Alligator Farm in Saint Augustine, Florida. And I was right…the placement of the platforms looks eastward so it is an afternoon location and the line of sight is narrow due to vegetation. The birds are also further from you than they are in Saint Augustine, Florida. If I had a choice of the two locations, Florida is so much better at either Alligator Farms – Orlando or Saint Augustine. I’m still trudging through my 4,000+ images that I took during our stay and there were some great outings that I’m excited to share with you. If anything, South Texas is an incredible place to go birding and for bird photography, especially during spring migration season. Migrants that travel from Mexico travel over the 600 miles and land exhausted along the coastline near Galveston and rest up before they continue on their journey. I don’t know, the Avocet shots were pretty wonderful. There are better coming up Willy. Thank you! Wonderful! Glad you could see 124 species in four days! Isn’t that something, and in your neck of the woods too right Pit? I’ve often wondered about these festivals I see advertised in nature magazines. Was it terribly crowded with other birders? It seems like it would be amazing to see so many migrants. We were on the field trips and the largest one had about 20 people or so. So truly not a lot of people at all. When we got to our destination they broke us up into smaller groups of 4-5 people to go birding. I know Magee Marsh in Ohio is a completely different story. Same for the Crane festival in Bosque de Apache. There weren’t as many warblers as I had hoped as the ‘fallout’ hadn’t happened yet and there was a terrible storm front coming in from the west.